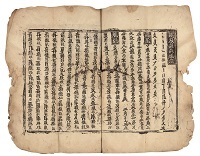 On 23 November 2014, at the Beijing Capital Library an auction of ancient documents was held by the Beijing Debao International Auction Co. (北京德宝2014年秋季古籍文献拍卖会). 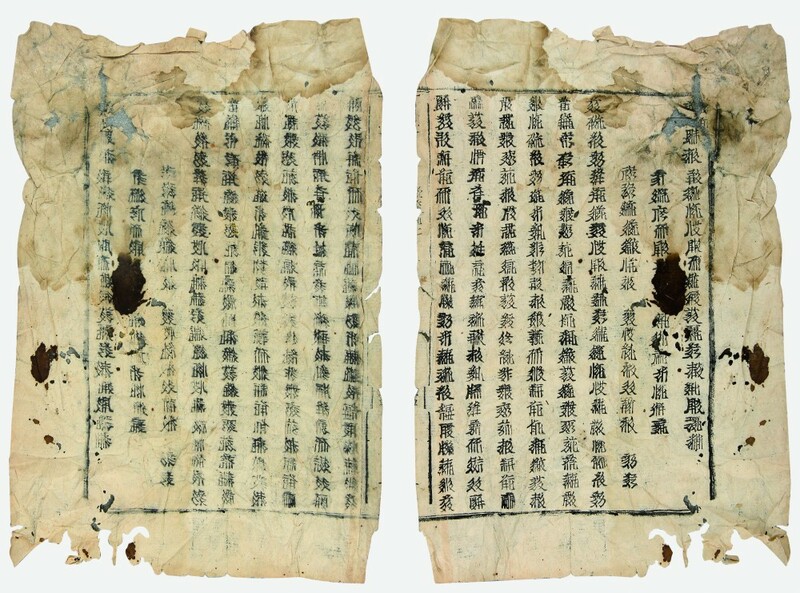 Among the 376 items under auction were nine lots consisting of Tangut manuscripts and printed texts, ranging from single sheets from manuscript or printed texts to a complete fascicle of a woodblock printed book. The sale of such a relatively large number of Tangut texts is unprecedented, and attracted a great deal of interest from buyers. Two of the Tangut lots (nos. 65 and 72) achieved the highest prices in the whole auction, and the nine lots sold for a total of ¥1,399,000 ($225,264). 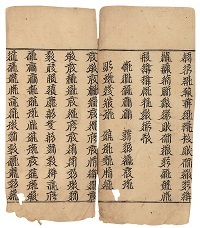 Number of sheets from a woodblock printed edition of the Tangut translation of the Vajracchedikā-prajñāpāramitā-sūtra. Woodblock printed edition of a Tangut dictionary, butterfly binding (1 fascicle [14 folios] and 1 loose sheet). 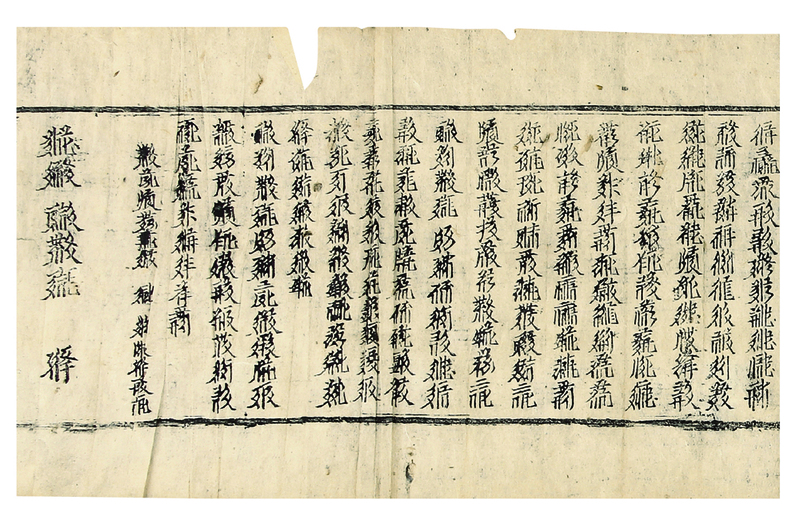 Sheet from a manuscript of a Tangut Buddhist text. 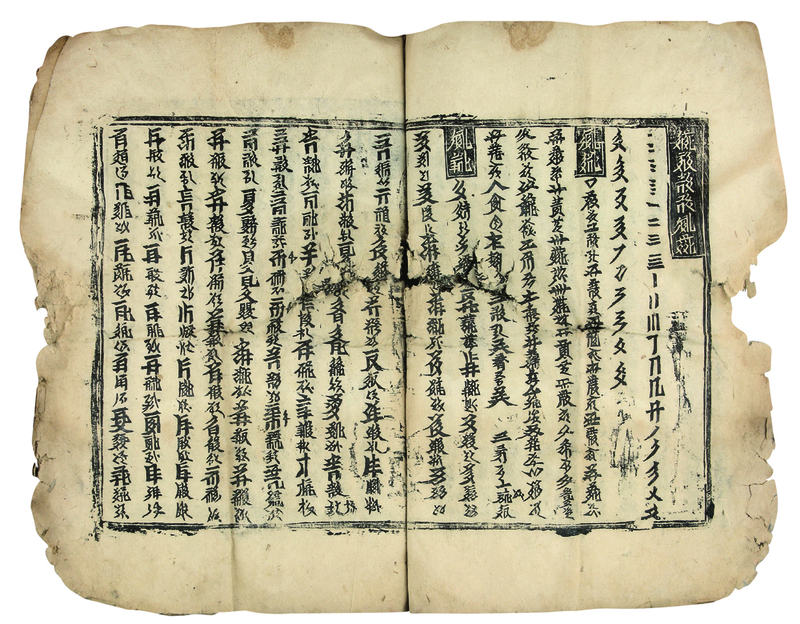 Half a folio from a moveable wooden type printed edition of a Tangut Buddhist text. 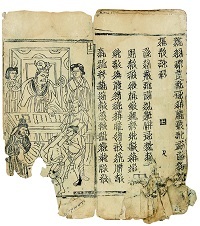 Final part of a woodblock printed scroll of a Tangut Buddhist sutra, printed on behalf of the crown prince. 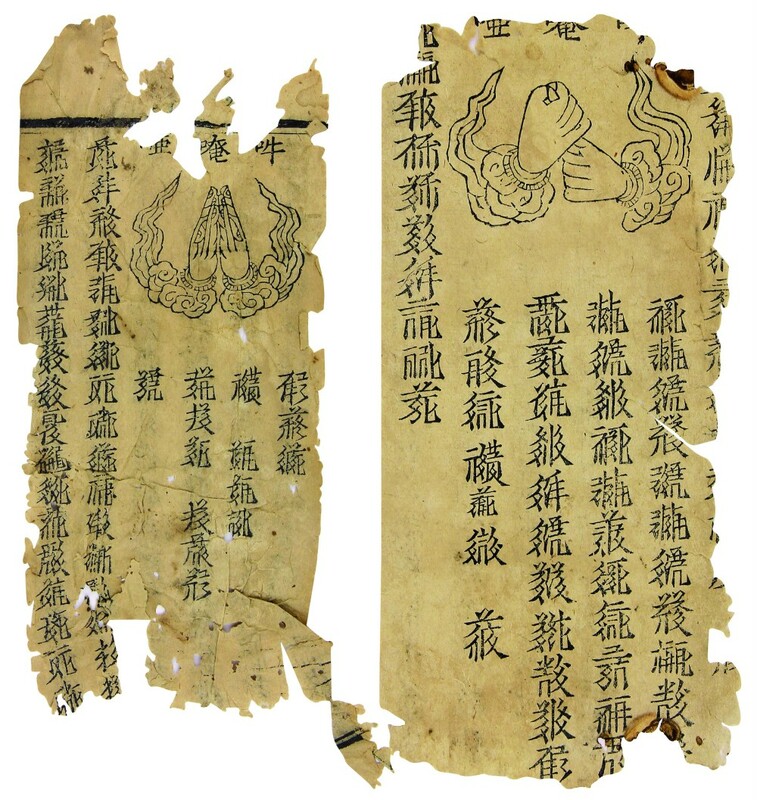 2 sheets from a woodblock printed edition of a Tangut Buddhist text showing mudras. 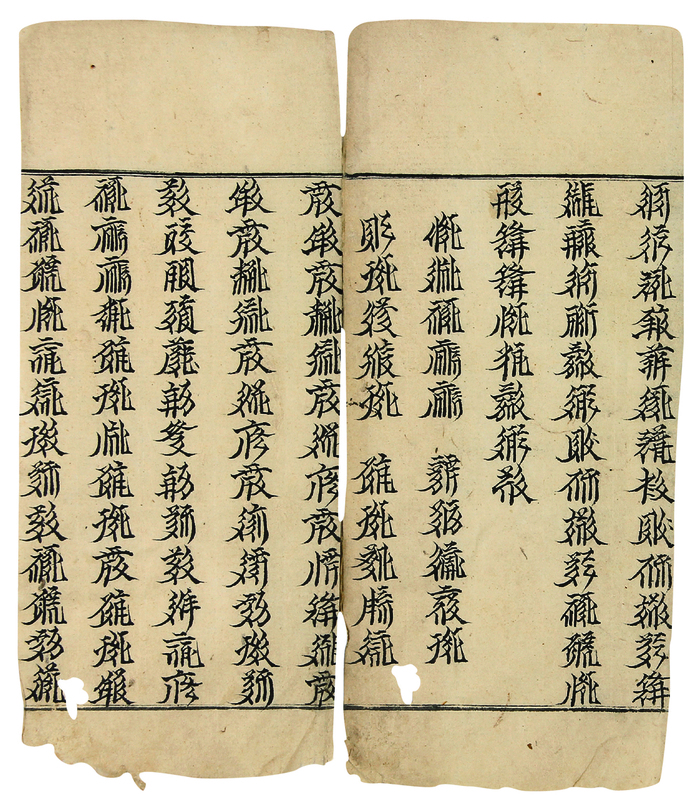 Number of sheets from a woodblock printed edition of a Tangut Budhist sutra. Number of sheets from a woodblock printed edition of a Tangut Buddhist sutra, with hand-coloured illustrations. Number of sheets from two woodblock printed editions of Tangut Buddhist texts, one an edition of the Sutra of Filial Piety, and one an illustrated edition of a text describing the judgement of the dead. Given the epidemic of fakes that has flooded the Chinese antiquities market over the last twenty years or so, it is reasonable to assume that any Tangut item for sale is a fake unless there is strong evidence to think otherwise. However, at first sight none of the nine Tangut lots in the 2014 auction are obviously fake. Although there are large numbers of fake Tangut coins on the market, and all sorts of dubious bronze and ceramic items with Tangut inscriptions can easily be found on Chinese auction sites, I have rarely seen a fake Tangut manuscript for sale, and I have never yet seen a fake woodblock printed Tangut text (I've looked and failed to find an example of a fake Tangut text to illustrate this blog post*). So, if these are fakes, they are very unusual. 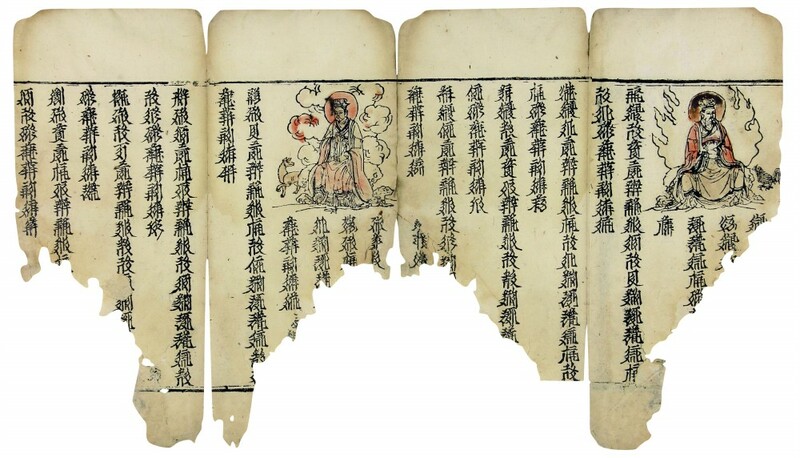 * I have been shown two examples of fake Tangut texts by private correspondents (which I am unable to put in this post): one written on paper and pasted on antique wooden boards with painted Buddhist images; and one written on rolls of silk, with coloured drawings. Both are outlandish in form and amateurish in calligraphy, quite different from the Tangut items under discussion here. 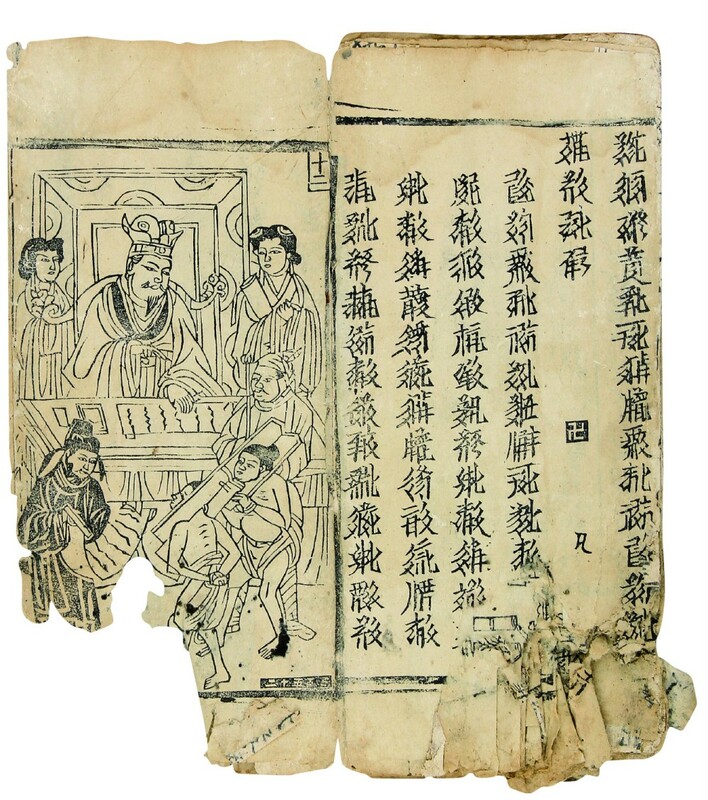 Significantly, they both comprise handwritten Tangut text, as it is an order of magnitude more difficult and time-consuming to produce fake woodblock printings than it is to to produce handwritten documents. No. 64. 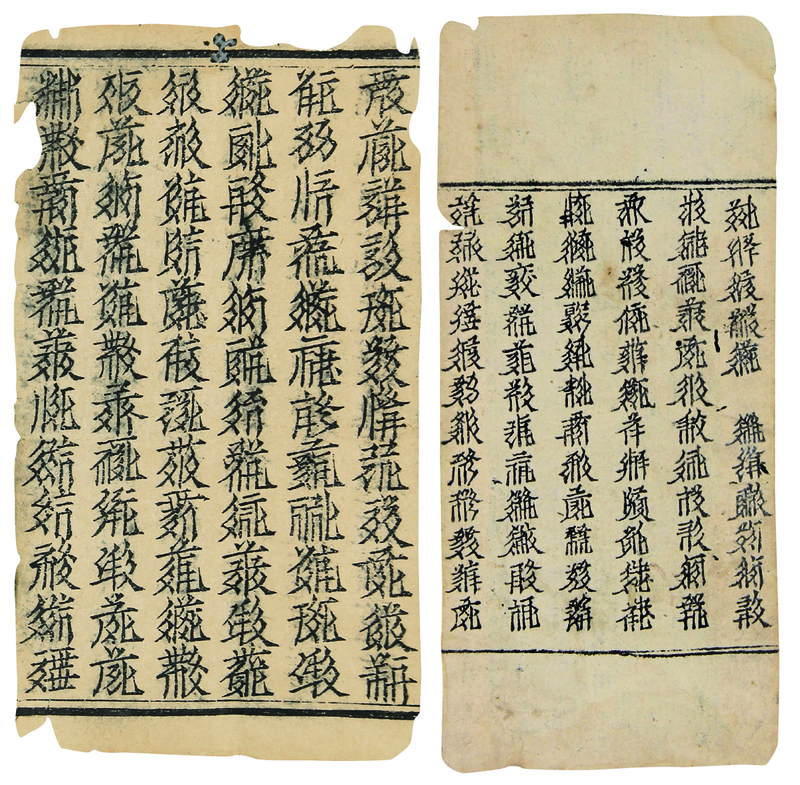 This looks like a typical sutra manuscript on typical sutra paper, although it is not impossible that it is a very good modern copy. No. 65. This is woodblock printed edition of an unknown Tangut text, and would at first appearances seem to be beyond the skill of any modern faker to produce. 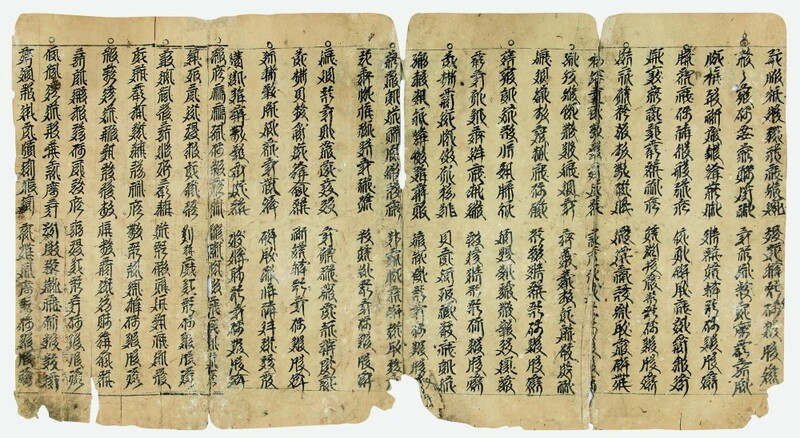 Unlike the Buddhist texts, which could conceivably have been copied carefully and exactly from genuine manuscripts or xylographs by someone with only a little knowledge of Tangut language and script, this text is unique, with no known model for the content, and it would have taken someone with exceptional knowledge of Tangut writing (including Tangut cursive script) and Tangut language to produce it. Moreover, this item is not just one or two sheets, but is a complete fascicle of fourteen folios, so it would have taken considerably greater effort and time to write the text, carve the woodblocks and print the book than it would to produce a fake manuscript fragment. I have heard some comments privately that the paper and the ink do not seem right, but it is very hard to judge these from a photograph, and there is nothing about the physical appearance of the text that raises a red flag for me. No. 66. This looks like a typical sutra manuscript on typical sutra paper. No. 67. 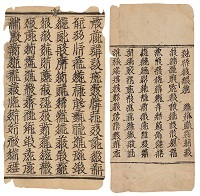 This is described as being printed from moveable wooden type, and the Tangut characters are unevenly aligned, unevenly sized, and unevenly inked, as if indeed printed from moveable type; but compared with known genuine Tangut wooden moveable type editions such as the Auspicious Tantra of All-Reaching Union these features are exaggerated, and it is either a poor quality genuine moveable type edition, or a not entirely successful modern attempt at moveable type printing. Fake Khitan wooden moveable type is not uncommon, so it is not implausible that someone has manufactured Tangut type matrices in order to fake printed Tangut texts, but on the other hand, the quality and appearance of this item is much better than any fake Khitan items I have seen. No. 68. 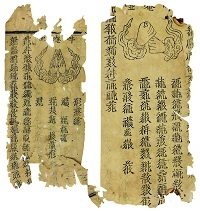 This is a woodblock printed scroll, which is uncommon but not unknown (Kychanov's Catalogue of Tangut Buddhist Texts in the IOM lists seven examples: Nos. 108, 322, 382, 401, 402, 600, and 646). The quality of the printing is not very good, but that is not unusual. No. 69. This seems like a genuine woodblock printed text. The mudra illustrations look authentic, and the use of Chinese characters for the Sanskrit mantras above the mudras is plausible. No. 70. This item comprise sheets from at least two woodblock printed Buddhist texts, and appear genuine to me. No. 71. This is perhaps the most suspicious item. Its hand-coloured illustrations are unusual, and typical of the sort of extraordinary feature that fakers often produce in order to entice a high price. The strange greyish-white colour of the paper may also be an indicator of that it is a modern piece. No. 72. This lot consists of two illustrated woodblock printed texts. They appear genuine to me. In summary, the texts appear to be plausible (No. 65 is unparalleled but far from implausible), with none of the amateurish mistakes and outlandish features that often mark out fakes. It is difficult to be certain about the physical aspects of the texts (paper and ink) without examining the items in person, but in my opinion the general appearance of these items (other than perhaps No. 71) is consistent with Tangut texts recovered from Khara-Khoto, and the Tangut calligraphy seems to be authentic. Without knowing where they come from we cannot rule out the possibility that at least some of them are very clever fakes, but if so they are very carefully and professionally done. And if they do turn out to be fakes then I imagine that more and more similar items will soon appear on the market (on the other hand, the success of this sale should give added impetus to looters and grave robbers to obtain by any means more genuine Tangut texts to sell at auction). If the nine Tangut lots in the November 2014 sale are genuine, then where do they come from? As is normal at Chinese auctions, no provenance was given for any of these items, and no-one seems particularly interested in asking awkward questions about who the sellers are and where they came by these precious items. We shall probably never learn the truth of their origins, but as there are no known examples of Tangut texts surviving from the time of their production up to the present time in private collections or in libraries, we can safely say that they are not heirlooms handed down from generation to generation, and they were not found in an old trunk in someone's attic. Small fragments of manuscripts could conceivably be found legitimately in the wild in Ningxia, Gansu or Inner Mongolia, and I have no reason to doubt the authenticity of this collection of about 30 manuscript fragments, including six small fragments of Tangut manuscripts, which was put on auction in Shanghai in March 2012 with an estimated price of ¥100,000 (= $15,880) ... although they did not sell. 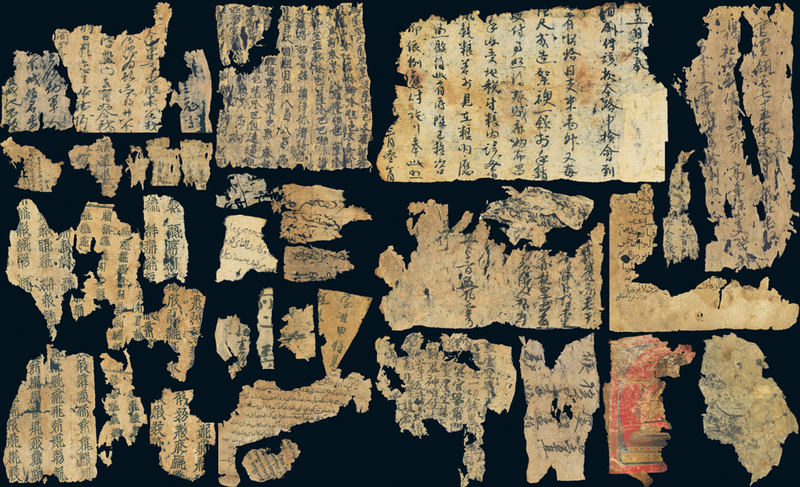 However, almost complete sheets of Tangut texts in relatively good condition, as is the case with the Buddhist items in the auction, are far less likely to be found just lying around in the desert. As to the complete fascicle (No. 65), it is must have been kept out of the reach of the elements to be in such a good state of preservation. The inevitable conclusion is that these items were illegally taken from an ancient tomb, stupa, pagoda or other historic site (of course, they do not necessarily all come from the same site). In recent years, criminals in China have gone to extreme measures to steal cultural artefacts, for example in 1990 the Western Xia period Baisigou Square Pagoda (拜寺沟方塔) in the Helan mountains of Ningxia was blown up by treasure hunters. 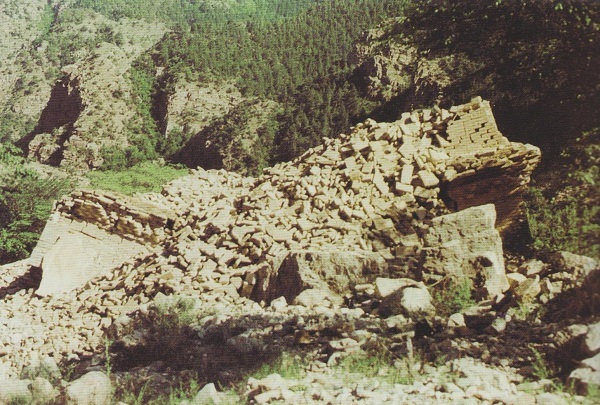 Although a large number of Tangut texts and artefacts were discovered in the ruins of the pagoda the following year (see here for pictures), no-one knows what else may have been removed by the cultural vandals who destroyed the pagoda, and it has been conjectured that No. 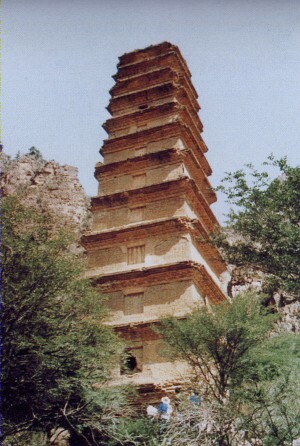 65 may have been taken from the Basisigou pagoda. But it is equally plausible that these texts were more recently dug up or removed from some other unknown site in Ningxia or neighbouring provinces. Eight of the lots in the 2014 auction consist of Buddhist texts, and although some of them appear to be rather interesting, and worthy of further scholarly study, the one item that has attracted most attention is No. 65. Although it is labelled as a "Tangut Dictionary" in the auction description, it does not seem to actually be a dictionary, but rather a general reference work on Tangut characters. This is a hitherto unknown work, and its appearance has caused seismic waves of astonishment amongst scholars of Tangut language and script in China and across the world. As the auction house understatedly puts it, this text "has great importance for the study of Tangut writing" 对于研究西夏文字有重要意义, but will scholars of Tangut writing ever get the opportunity to fully study this text? When it was sold to an unknown private buyer in 2014 no-one knew whether the purchaser would make it available for academic study, or whether he would keep it in a private collection or simply locked up in a safe as an investment. There was no guarantee that the text would ever be seen in public again, or ever be made available for study by Tangut scholars. It is a great relief, and bodes well for the future study of this text, that the current owner, now revealed to be Tong Zhixin 童志新 (an entrepreneur from Zhejiang? ), has recently allowed the book to be put on public display. This exhibition item is a dictionary-type classic book, comprising 14 surviving folios. The first three folios comprise two prefaces; the following 2 folios (?) [are] explanations on the structure and radicals of Tangut characters. The main text consists of phonetic readings and explanatory glosses for frequently used Tangut characters and words. Although this book is very thin, its contents are very rich. In order to let people study Tangut writing even better and quicker, the author especially dissects the construction of Tangut characters into radicals, which is done in great detail. What is even more valuable is that every example character for each radical is accompanied by the cursive form of the Tangut character. Among Tangut documents preserved in China and abroad, this is the only surviving example of this kind of book, and it is of great value. I fervently hope that images of the complete book will be published in the near future, but at present all that has been made public are low resolution images of the cover and two and a half folios of text. In my next blog post I will undertake a preliminary analysis of this book, based on these incomplete photographs.